An overcast day – the final day on the calendar in May – was as good of a day as any to make our first trip of the year to the ballpark to see a game live. The Reds didn’t disappoint their home crowd as they have on so many Sunday’s in the past. The Nationals bullpen melted down in the bottom of the 7th inning, allowing six runs that took a 2-2 ballgame to an 8-2 game which was the final score. As for things we saw at the park today that we’ve never seen before, Joey Votto drew a three-ball walk. We saw it, and had the silent thought ‘hey that was only three’ but Votto dropped his bat and trotted down to first so quickly we thought we were just tired. 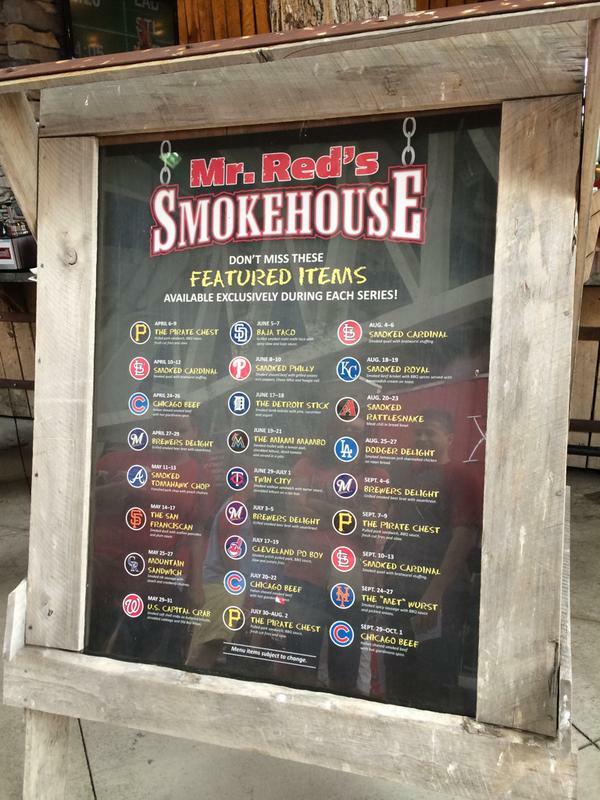 One of the best places to eat at the park these days is Mr. Red’s Smokehouse. When I started making trips to Riverfront Stadium, they had nothing like this. Now the Reds welcome a piece of the menu from every opposing team in baseball. A really cool idea. We had the crablegs sandwich for lunch – dubbed the “U.S. Capital Crab”. It was very good but almost too salty with all the damn Old Bay seasoning on it. Who says Bryce Harper doesn’t like to sign autographs. He signed for every kid that was doing the Redlegs Run-on. I’m sure each Red liked seeing the Bryce Harper signature on the ball by the time the kid arrived at their spot. The Reds have started to do a cool new feature when they announce the staring lineup. Michael Lorenzen hit 8th today. That seems to be a trend all around the National league right now. The Reds we know at the core might not be much longer. Granted, there are a few reserve names penciled in there. But several of the guys on this list may not be wearing the uniform much longer. If indeed this was the last time we get to see a Jay Bruce or Brandon Phillips play in a Reds uniform, we wanted to make sure we had this here. You just never know. There’s Todd Frazier next to Billy Hatcher in the National anthem. The Toddfather had himself a day. Towering bomb to left to kick off scoring and two other hits. Michael Lorenzen had a really nice day. He was throwing the ball well and not missing his spots by much, spotting up the fastball at 92 to 94 MPH. He walked the bases loaded in the top of the seventh which led to the only two Washington runs and was subsequently pulled. But overall, this guy has a nice arm and fluid delivery. Draftkings’ advertising is taking over baseball. We cashed in our 50/50 this afternoon at least. My wife asked me if I thought any players played on Draftkings. I had never really thought about it – but they might. Harper getting his warm-ups in with Ian Desmond. Ian Desmond and Danny Espinosa. Denard Span is a quality, unheralded player. Really glad I got to see Denard Span play. He ran down a couple deep flies in center field. He has great range and covers a lot of space that you can really appreciate when you’re at a game live. Here’s a guy whose name will become a lot more well-known as this blog entry ages: Wilmer Difo. He didn’t play today. 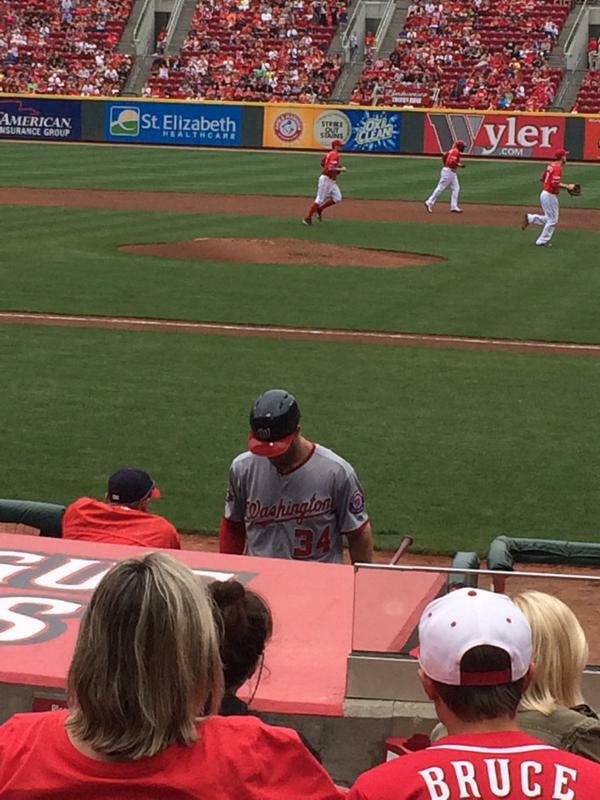 Harper flew out to left, walked twice, and grounded out. He scored one of the two Washington runs. Pretty neat that in the finest month of his big league career we were able to see him in action.